Chinese Medicine addresses colds and the flu according to “type” that is whether the symptoms are the result of a cold or heat-type pathogen. 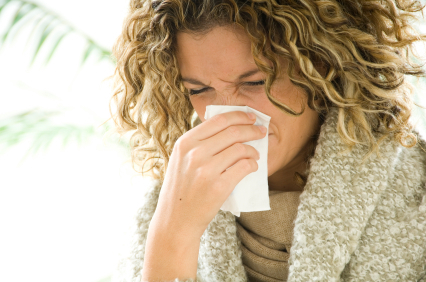 Most colds are classified as either a Wind-Cold or a Wind-Heat syndrome, with most of them starting out as Wind-Cold. These pathogens enter the body when the immune systems defenses are down. The first step that Chinese Medicine takes is to strengthen the body’s defenses, or what in TCM is referred to as Wei Qi. See this great article on the concept of Qi. Cold Signs & Symptoms – Usually begins with a sore throat that resolves within 1-2 days. Nasal symptoms & possible cough. Adults don’t normally get a fever, but children may. A cold normally resolves in 5-10 days. A person is generally contagious for the first 72 hours. If the more severe symptoms don’t resolve within a week, you should check in with your physician to see if you have a possible bacterial infection. Remember that often times a lingering cough may take 3-4 weeks to fully resolve. Flu Signs & Symptoms – Usually more severe cold symptoms with a much faster onset – usually within 3-12 hours. Fever, chills, headache, muscle pain, congestion, cough. Possible vomiting or diarrhea. The initial 3-6 days are usually severe, but symptoms may linger for 1-2 weeks with a general feeling of being run down as well. The differences between wind-cold and wind-heat aren’t always clear cut, but if you’re curious here is a further description. A wind-cold manifests as a runny nose with clear mucus, headache and a stiff neck with muscle aches. You may also have an itchy throat, but not a sore one. A wind-heat type of cold usually consists of a sore-throat, headache, runny nose with colored discharge, muscle aches, possible fever and/or sweating. These are generally symptoms that feel more like the flu, but can also be bacterial infections such as strep-throat. Basic Recommendations: The old wives tale “Feed a cold, starve the flu” holds true. You do want to eat if you are sick, but often with the flu, you won’t have much of an appetite. The most important thing is to try and stay hydrated, especially if you have had any vomiting. A great source to rehydrate is nature’s own Gatorade – coconut water. It’s available in most supermarkets now. You want to eat lighter than you normally would, as you want to give your body a chance to recover and it needs to rest as opposed to spending a lot of time digesting a heavy meal. Soups and stews are great when you are sick, but try to avoid eating too many raw foods such as salads and fruit right out of the refrigerator. My favorite recommendation for someone with more of a wind-cold syndrome is to eat chicken or miso soup and to drink ginger tea. For a wind-heat syndrome, you want to avoid the warming spices that you would use in a wind-cold situation. However, you many find that you need to use ginger in moderation to help with nausea. Peppermint tea and chicken soup with lots of greens are good choices.